Jefferson may have one of the few systems in the country that is able to actually develop reports separating metered energy use for a classroom and a research lab in the same building. Of late there have been some interesting developments in the marketplace that I believe will result in more real-time energy metering and management. There is merit to being a student of trends and these developments are driving three significant trends for energy on line. These trends may seem completely unrelated; yet LEED (Leadership in Energy and Environmental Design), Integrated Systems and Web-based Energy Metering are poised to merge in a new and unique way. Each of these trends is evolving in its own right with a great deal of visibility. LEED, a design criteria and rating system from the United States Green Building Council, is becoming a driving force in new construction. The design criteria are comprehensive and encompass every aspect of new construction from siteing to energy efficiency and indoor air quality and awards points based upon design and innovation. The aspects of LEED that have gotten my attention include: optimizing energy performance, commissioning and measurement and verification, which relate directly to the latter two trends but more on those later. Even more exciting, a pilot LEED rating system for existing buildings was published in January 2002. According Mike Arny of the Leonardo Academy, who is the chair of the LEED for Existing Buildings (EB) Committee, about 90 buildings are currently being evaluated under the Pilot Rating System. The LEED EB rating system requires sustainable performance in existing buildings for at least four months to get certified, and re-certification requires a year of data. LEED EB will use Energy Star's Benchmarking Tool to measure sustainable performance. This tool establishes fixed benchmarks based on building type, size, occupancy, location and other relevant data. For example office buildings will consider factors like the number of computers, while schools identify the number of months in session and percentage of floor space cooled. Integrated systems, another major trend, can be critical to earning LEED points. The integration of traditional building systems for HVAC, fire and security has been discussed before in this column, along with the convergence that is occurring between these systems and Information Technology including the Internet. The potential that LEED will become a driving force in existing building retrofits should accelerate the trend toward integrated systems, as a management tool to ensure that sustainable performance is achieved. Automation systems are truly the best way to control equipment and manage energy consumption on a real time basis. Furthermore, if measurement and verification (M&V) is done in a dynamic fashion it becomes possible to maintain efficiency over the long term, something that is not often achieved. Energy metering for M&V that includes automation and goes beyond simple utility revenue becomes a big issue in this process. In smaller buildings with simple processes, like elementary schools or low rise office buildings, it may be perfectly acceptable to simply track data from the revenue meter for M&V. In complex buildings, especially those with mixed-use, this is not acceptable however, because it is necessary to separate the different drivers for energy consumption. My early efforts to find an example of forward looking real-time metering turned up few sites, until I met Randy Haines at Thomas Jefferson University. Jefferson is a great example of meeting the real-time energy metering challenge, and Mr. Haines is reaping real benefits for his institution by taking the industry lead. They may not be LEED EB certified today, but it truly exemplifies the concept. 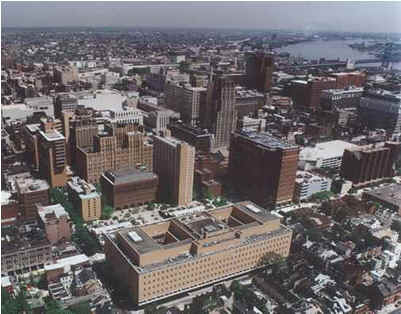 Jefferson is the largest healthcare system in the Philadelphia area, and includes a group of hospitals and a teaching university. The Jefferson Health System (JHS) consists of more than 10 million square feet of property with a $40 million per year energy bill. It seems only reasonable that an energy expenditure of this magnitude would get managements attention. Mr. Haines said that even with institutions that have large energy budgets it can still a challenge to sell the "smart metering" investment up the chain. In the end there were a number of factors that contributed to selling the system benefits at Jefferson. 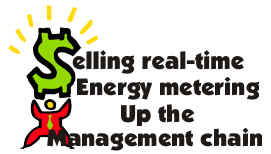 Real-time energy metering may be new to some, so it is important to briefly describe these systems. The system implemented at Jefferson generates real-time energy information by accessing data from meters through the entire system. To do this electro-mechanical meters were retrofitted to provide pulses and fitted with data loggers, which capture data at 10-minute intervals. Using web appliances these data loggers were tied to the JHS Intranet for regular polling to upload data to a central database, and then Web published the data so that hospital users can access this data via the Internet using any computer. Also since this is a campus application it is necessary to implement flow meters, BTU meters and other devices to capture data from a district steam loop and chilled water loops. Information can then be integrated with an automation system, and it is even possible to sub-meter areas of a building. Jefferson may have one of the few systems in the country that is able to actually develop reports separating metered energy use for a classroom and a research lab in the same building. This has significant implications for many organizations that charge tenants for energy on a square foot basis and therefore create no incentive for individual users to reduce consumption. Even more exciting, Mr. Haines is able to compare energy information on an interval basis to make decisions about changing building operations during a billing cycle. He also compares his systems data with his utility bills on a monthly basis and typically finds that it is accurate to 1/10 of 1%. The net result at Jefferson is real cost savings in a number of areas. First the cost of energy is being reduced. Pennsylvania is a deregulated state for electricity, so it has been possible for Jefferson to use sophisticated energy profile data to save money through effective procurement. Even billing errors can be caught that would have slipped through the cracks in the past. Accurately tracking of energy cost for different types of spaces also could allow Jefferson to pass on some utility costs that the institution would have previously paid. Enhancements are still happening as well, recently Haines implemented a demand tracking system that looks for spikes in kilowatts, kilowatt-hour and M pounds of steam on a 10 day moving average, this will allow him to react quickly and avoid costly charges. Is there a connection between LEED EB, integrated systems and real-time metering? Yes, and organizations like Jefferson can show us that it is worth the investment. Individually the ideas embodied by each of these trends may not be new, but I believe that in combination they represent the leading edge of energy management and the future of our industry. Mc Gowan is President of Energy Control Inc., an Energy Service Company and System Integrator. He is the author of 5 books including "Direct Digital Control" on Fairmont Press. The Association of Energy Engineers named him 1997 "International Energy Professional of the Year and admitted him to the "International Energy Managers Hall of Fame" in 2003. Mc Gowan sits on the Energy User News Technical Advisory Board and is a contributing editor with www.automatedbuildings.com.